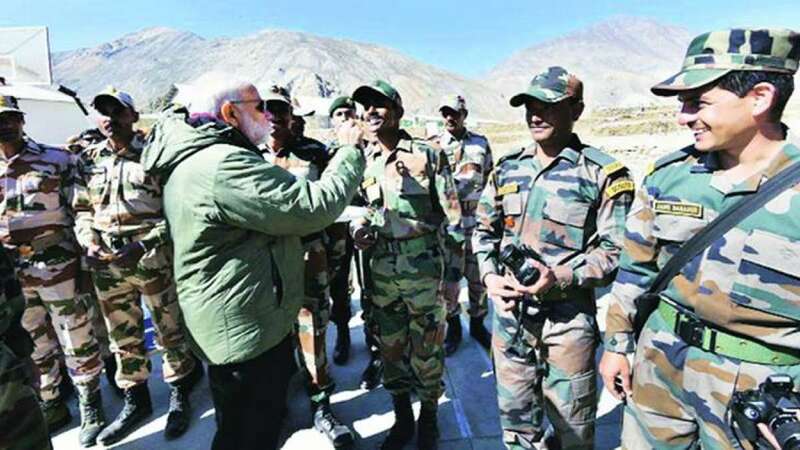 Los angeles : In a heartfelt gesture, Prime Minister Narendra Modi spent Diwali with Indian Army jawans of the Indo-Tibetan Border Police and Dogra Scouts. These jawans have been deployed at forward posts along the Sino-Indian border in Kinnaur and Lahaul-Spiti in Himachal Pradesh. The PM’s visit comes at a time when tensions have been flaking with Pakistan and sentiments have been running high within the Army. In his latest Mann Ki Baat, he also dedicated a large part of his talk hailing the soldiers, their sacrifices and saluting their bravery and courage. “Our forces endure grave hardships for our security. Someone is stationed in a desert, someone on the Himalayas, someone is guarding our industrial installations and someone is protecting our airports. Everyone is fulfilling a mighty responsibility. If we remember them while being in a festive mood, our remembrance will give them strength and renewed energy,” he added. Interestingly, PM’s visit was kept secret and only came into light after his chopper landed at Chango, near Sumdo where he spent 15-20 minutes with jawans and distributed sweets. Sumdo is a base camp of the Army and ITBP in Lahaul-Spiti. Happy Deepawali: He also talked at length on how the festival of Diwali has illuminated minds of people across the world and the importance it is being given by the heads of various countries.